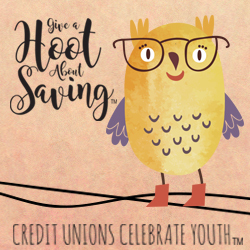 Throughout the month of April, we will be celebrating our youngest members ages 0-17 with the Give a Hoot about Savings theme! Our goal is to stress the importance of saving early to show that it can be fun and rewarding. Specifically during the week of April 17 to 21, we will be offering scholastic giveaways, prizes and Tootsie Pops! Those who open a youth account during the month of April can pin an owl onto the life-sized tree that will be in our lobby! Stop by for a visit during the month of April as things get a little HOOTY around here! It’s never too early to start giving a Hoot about healthy savings habits!